A question about Texas history has been solved thanks to new, rare maps that The Texas General Land Office now has on display. The Texas General Land Office has a hefty collection of about 45,000 different maps, but they just acquired five rare ones. James Harkins is the Director of Public Services for Archives and Records at the state and office. 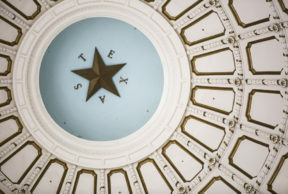 “Today, we are announcing that we received a portion of some of the most important maps in Texas history, which are the Republic of Texas boundary with the United States from 1840 to 1841,” Harkins says. Until the land office acquired these maps, it had an idea of where the border ran between the Republic of Texas and the United States but, as Harkins calls it, it was a no man’s land. No one could be sure. “But after these maps were made, we figured out that a portion of land that before would have been considered part of the United States, part of the Arkansas territory, actually became part of Texas. So, Texas gained several hundred acres,” he says. Harkins says that if you were to lay a map of Texas today over Texas of 1840- 1841, the two would pretty much line up. And that’s exciting for the land office experts who had thought Texas then was smaller. The land office learned about the maps when they received an email from Barry Lawrence Ruderman Antique Maps in California. “So he emailed me shortly after Christmas. I think the name of the email was “I might have an extra end of the year present for you,” Harkins says with a laugh. Harkins was beyond excited when he heard what Ruderman had to sell. The land office had known these rare maps were out there, but they had last sold for $100,000. That wasn’t anywhere near the land office’s budget. Ruderman gave the state a bargain price—$8,500. “These maps really helped define our shape, more so than almost any other map that there is. If there’s one things Texans love, it’s the way Texas looks and these maps really define that, especially along the Eastern Boundary with the U.S.,” he says. Harkins says though the acquisition of the five rare maps is a huge boon, those five are actually part of a set of 10. The other five are still missing. The land office hopes the public will want to chip in to help find the remaining maps to complete the set. The boundary maps will be on display at the Witte Museum starting April 29. They’ll be among 40 other maps of Texas. You can also view them on the Texas General Land Office website. What’s Happened in Houston Since HERO’s Defeat? Do Over Half A Million Texans Lack Proper Voter IDs?